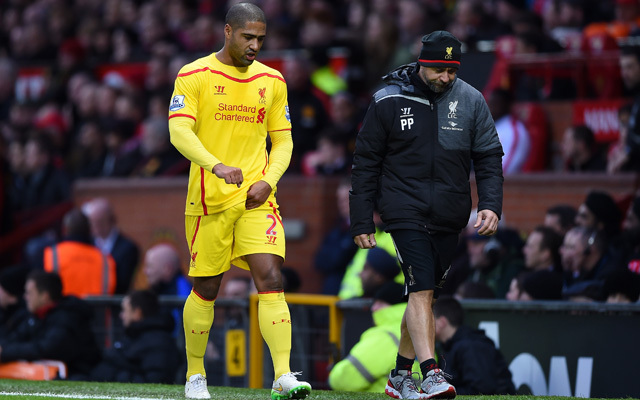 Liverpool defender Glen Johnson does not expect to be offered a new contract to remain at the club beyond the end of the current campaign. Johnson has only made 17 Premier League appearances for Brendan Rodgers’ side so far this season, while his recent performances have attracted their fair share of criticism from the Anfield faithful. The full-back’s current deal expires at the end of the season and West Ham United are believed to be interested in taking him, according to reports from The Metro. Johnson, 30, was recently asked about his future and confirmed that he expects to be moving on, ending a six-year association with the Reds which has seen him make almost 200 appearances. The news will come as no great surprise to Liverpool fans, who have been growing uncomfortable frustrated with Johnson’s performances. And with Jon Flanagan edging closer to his return from a long-term injury, Johnson could soon find his role in team further marginalised. West Ham handed Johnson his professional debut back in 2002, ahead of a move to Chelsea. He made 70 Premier League appearances for the Blues before being allowed to join Portsmouth in 2006, initially on loan and then in a permanent deal a year later. He won the FA Cup with Harry Redknapp’s side and moved to Anfield a year later, where he’s since added a League Cup winners medal to his collection. He’s also made 54 appearances for England in that time, scoring once.